ØRB Studio is a full service sustainable architecture and energy efficiency consulting firm. ØRB works on new construction and major renovations pursuing rigorous, ultra-low energy goals such as Passive House, net zero energy, and Living Building Challenge. The firm collaborates with individual homeowners, architects, builders, developers, institutions, neighborhood groups and self-builders in an integrated design process. Our work draws from the unique character of each site, the vision and personality of each client, and the desire to make energy efficiency beautiful. We are inspired by the challenge of designing with a whole system perspective and by the desire to generate forms that merge the technical, aesthetic and financial aspects of a project into an elegant and holistic expression. ØRB Studio’s experience includes the application of sustainable, low-maintenance and natural materials, passive systems, water efficiency, on-site waste and water systems, and renewable energy. ØRB is committed to the 2030 Challenge and delights in incorporating the practical concerns of sustainability, durability, cost-effectiveness, safety and comfort. 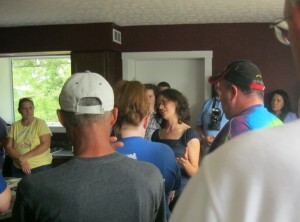 Ginger Watkins, Principal Architect of ØRB Studio, designed the first certified Passive House in Kentucky, demonstrating that ultra-low energy building techniques can be affordable and achievable with local skill. ØRB is continually innovating and is currently making advancements in novel super-insulated and air-tightness details and developing sustainable systems including open source energy data monitoring, passive whole-house ventilation, minimized HVAC systems, biomass heating, humidity buffering, seasonal earth coupling, solar technology and owner-builder appropriate techniques. ORB Studio opened its doors January 9, 2012.